The thyroid gland helps control metabolism (how fast your heart beats and how you burn calories). Hyperthyroidism is when the thyroid gland becomes overactive. There are different types of hyperthyroidism, such as Grave's disease, toxic nodular goiter, and thyroiditis. It can result from the body giving signals to the thyroid gland that make it overwork. It can result from inflammation (irritation and swelling) of the thyroid gland. It can result from tumors of the thyroid gland or problems with the pituitary gland. Women are more likely to get it than men are. It can affect anyone, but is most common in young or middle-aged adults. The doctor may need to take several tests to see if there is a thyroid problem. The goal of treatment is to help the thyroid gland work correctly. Treatment depends on the patient's age, the cause of the problem, and how bad the symptoms are. Medication may be used to regulate how the thyroid releases hormones. Medications can also be used to treat symptoms. Surgery may be needed to remove part of the thyroid. This often does not correct the problem but helps people feel better. People with hyperthyroidism should have regular check-ups. If you need to gain weight, ask your doctor for suggestions. Also ask your doctor how to make sure you are getting enough calcium. If left untreated, it can lead to death. 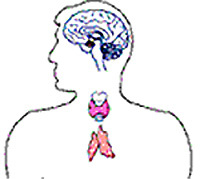 A person with hyperthyroidism may need medication his whole life to prevent problems. Other people may need treatment only once. Call the doctor if your child has symptoms of hyperthyroidism. Go to the emergency room if a person with hyperthyroidism starts to have worsening symptoms that may include fever, a rapid heartbeat, or confusion. Sometimes, it can result from tumors of the thyroid gland or problems with the pituitary gland. Symptoms are different for each person and also depend on what type of hyperthyroidism it is. People with hyperthyroidism may need treatment only once or throughout their whole life.